I’M SHARING A FULL LENGTH CREATIVE EXERCISE FROM THE CREATIVE REVOLUTION E-COURSE! I believe shifting creative gears is an essential part of staying inspired and developing your own unique style. I’m a big fan of all these shifts, especially the one about playing, and one great way to do this is through Visual Riffing. The best way to approach Visual Riffing is to think of it as a game. It’s not at all about producing a master piece to hang on your wall. Instead, it’s about loosening up within a somewhat confined “container” as a way to discover new shapes, get unblocked, and generally get your creative juices flowing. Try warming up with a little Visual Riffing before your next painting session, or riff your way through your next bus or plane ride. The possibilities are truly endless! I hope this exercise not only inspires some creative play, but also gives you a little peek into the look and feel of the Creative Revolution E-Course. As you’ll see in the video, I share each exercise with an (awesome) group of students, who, in turn, explore the prompts in their own ways and share their experiences at the end. You’ll find Visual Riffing in Week One. Over the next few weeks, I’ll tell you more about other elements of the course, including the Movement Sequences, Morning and Evening Sanctuaries, the Art of Aliveness Series, and more. 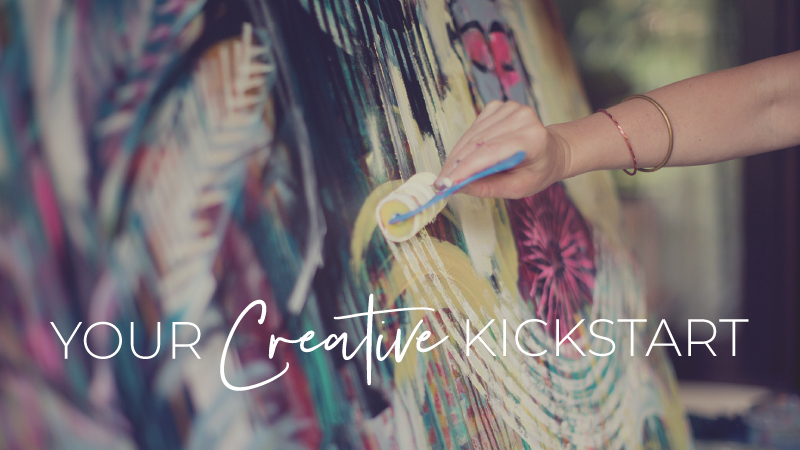 If you’re considering joining me for the Creative Revolution E-Course, you’ll get a little taste of what’s to come, and if not, I hope you’ll get some inspiration along the way! Seven weeks of transformational, accessible, and lasting way to integrate more creativity into your everyday life. 35 + HD videos featuring three camera angles and professional sound and lighting, all shot in my Portland, OR, studio. 7 wonderful students to demonstrate and bring the course to life! 21 + original audio files featuring the Art of Aliveness Series, Morning and Evening Sanctuaries, Meditations, and more. 6 months of access to all course material. NOW WITH LIFETIME ACCESS! 3 live video calls with Flora. Access to a community of creative people from across the world. Continued support and bonus prompts after the course is over. Spotify playlists of my favorite art-making tunes. A gorgeous, 39 – page downloadable PDF guide to the course. Enough guidance, encouragement, and ideas to last a lifetime! Feed Your Soul. Transform Your Life. Join the Revolution! YOUR APRIL DESKTOP CALENDAR IS HERE! YOUR MARCH DESKTOP CALENDAR IS HERE! YOUR FEBRUARY DESKTOP CALENDAR IS HERE!